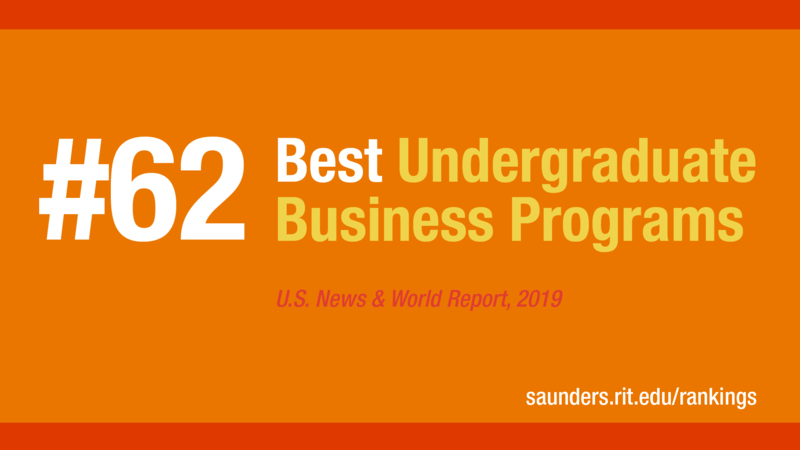 Saunders College of Business now ranks #62 out of more than 400 business colleges for undergraduate business programs in the 2019 U.S. News & World Report "Best Colleges" ranking, moving up two places from last year. The tech-focused business school is rapidly gaining attention, also recognized for its advancements in graduate programs. Saunders College of Business is on the rise both nationally and regionally - now ranked #1 undergraduate business program in the Rochester region, which is home to a rich and diverse set of business schools and programs. "We are so honored to have our undergraduate program acknowledged with the best Universities in the nation, and particularly proud to be recognized as the best school in the Rochester region - this is a testament to our amazing students, faculty and staff," said Saunders College Dean Jacqueline Mozrall. "As a business school at the intersection of business and technology, we have a strong entrepreneurial culture with the RIT Edge." RIT, among guidance counselor’s top 50 choices, is quickly developing and keeping up with trends across a multitude of industries. RIT encourages career-focused, experiential learning through applied curricula and cooperative education. The efforts of Saunder's faculty, partner businesses, and Office of Career Services and Cooperative Education have earned RIT a ranking of #7 for Career Services by the Princeton Review. Rochester Institute of Technology is among the top third “National Universities,” according to U.S. News & World Report rankings. Saunders College of Business is one of nine colleges at Rochester Institute of Technology and is accredited by the Association to Advance Collegiate Schools of Business International (AACSB). Recognized and ranked internationally, Saunders is home to more than 2,000 undergraduate and graduate students enrolled in programs across RIT Global Campuses in Rochester, New York, Croatia, Dubai, Kosovo and China. Saunders College works in partnership with RIT’s entrepreneurial Venture Creations incubator and top ranked Albert J. Simone Center for Student Innovation and Entrepreneurship to integrate business education with RIT’s world-leading technical and creative programs. With nearly 19,000 alumni worldwide, Saunders College offers undergraduate (BS), Masters (MS), Masters of Business Administration (MBA), and Executive MBA (EMBA) programs where students gain real-world business experiences through a tradition of applied learning, internships and capstone programs.